The product must be the same manufacturer, model, color and version. We'll beat most major retail and online stores. Some retailers offer coupons, rebates, bundle discounts and other special promotions that do not qualify. Visit any curacao store and show us the printed ad or online price. Call us at 1-877-CURACAO or 1-877-287-8886 and an associate will help you. We'll beat the price by 10% of the price difference. Curacao's price beat guarantee ensures that you are always getting the best deal on any item sold in our store online, even after you've made your purchase. 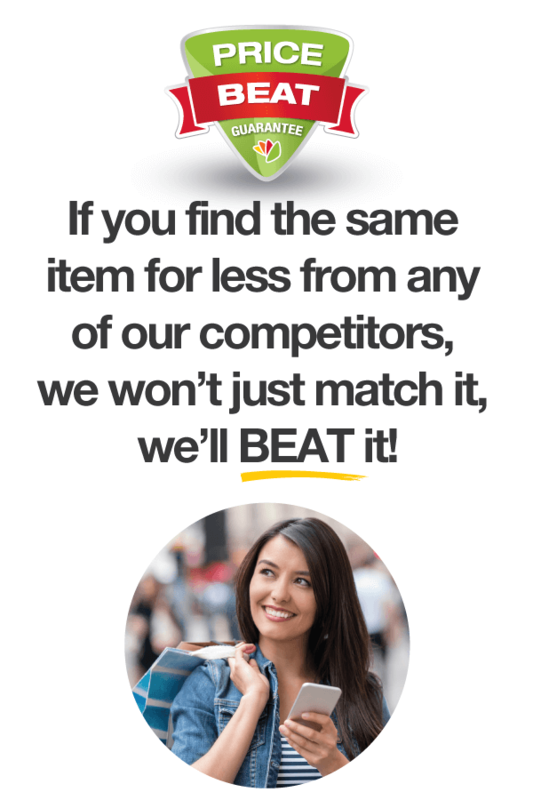 Curacao strives to ensure that we have competitive pricing on all items everyday, but on occasion a competitor may offer the same item forr less. With Curacao's price beat guarantee, we will not only match the competitior's price, but we will BEAT it! That's our promise. Where can I get a PRICE BEAT done for purchase? What product can I get a PRICE BEAT for? How much will I receive on a Price Beat? What retailers do you PRICE BEAT? What do I need to provide to receive a PRICE BEAT? Are there any restrictions on product condition? We will not PRICE BEAT refurbished, As-Is or open-box items, Cell Phones that require activation (including Unlocked cell phones). What are the program exclusions? Excluded from the PRICE BEAT program are Mail-in Rebates, Coupons, Gifts with, Purchase, One Day or Hour Sales, Percent Off/Dollar Off, Cell phone Activation or Carrier Plans, Packages / Bundle Discounts, Price reductions from rewards programs, VIP / Friends, Family Sales, Typographical errors in advertising, Special Financing, Services, Warranty, Delivery, Installations, pricing for which inventory is not available, Curacao Export or Curacao Travel.